Greetings from Victoria Falls, Zimbabwe. In our last newsletter we left you in Tsumeb, Namibia. On our way out of Tsumeb we had afternoon tea with Ed who we met a few weeks ago at Palmwag Restcamp near the Petrified Forest. Ed is the RSPCA representative in Tsumeb. 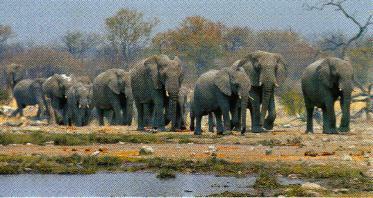 We got some good advice on Khaudom NP, which is in the far North East corner of Namibia bordering Botswana. The first night enroute to Khaudom, we bush camped under a very overcast sky. Fortunately, it did not rain. The next morning we left camp at 7am which was our record earliest departure time. The road was slow going due to the corrugations and deep sand. The next night we stayed at Siskereti camp in Khaudom NP which featured a sign to beware of Elephants, Lions and Hyenas roaming free in the campgrounds. This was very different to Etosha NP where the campgrounds were enclosed by high fences. After stopping early at camp we spent the afternoon helping our Kenyan friends repair their Landrovers canopy, horn, fuel gauge, temperature gauge and hazard lights. Kienny and Su-lin did the laundry, played scrabble, read a book and cooked a beautiful meal of chilli pork chops. During the night we heard hyenas searching through the camp rubbish bins. Travelling through Khaudom NP we saw a herd of very large elephants which we watched for some time from our rooftop. We had an early lunch stop when the Landrover started overheating due to a broken fanbelt. Over the weeks Su-lin had been steering the Troopie along the quiet slower sections of the road. On our way to the northern Khaudom NP campground Su-lin drove Troopie all by herself. We had a few kangaroo hops at first but she eventually got the hang of it and drove for over an hour till we reached camp. She is growing fast and we are constantly amazed at her ability to recognise animals and birds. She has finished all her Grade 4 school work and is now working on next year’s Grade 5 homework and is eagerly awaiting the arrival of her cousins in early December. Unfortunately we didn't see much other wildlife in Khaudom NP. Most of the park was burnt out earlier in the year due to a bushfire, which came through from Botswana. The park is VERY sandy in places. On leaving the NP it took us four hours to the main highway - a distance of 55 km. From here it was only an hour’s drive to Popa Falls which is close to the Botswana border. It was raining steadily as we left Popa Falls and headed for Mohembo which is the border town between Namibia and Botswana. This was only our second afternoon of rain since arriving in Africa. Immigration and Customs formalities were efficient, friendly and straightforward. 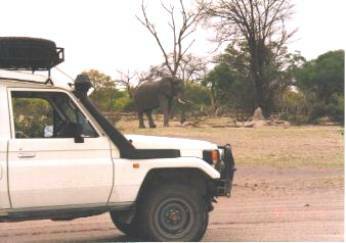 We then bush camped on the road to Tsodilo Hills and did a service on Troopie as we have now done 10,000km since leaving Australia. This was a very sandy track however the rains made the going a little easier. Tsodilo Hills is an undeveloped NP with almost no facilities. The hills rise 300m above the surrounding countryside and is perhaps the highest mountain in Botswana (?). These hills are a museum of bushman paintings containing some 350 galleries. We spent some time exploring the paintings and climbed to the top of the highest peak. We then bush camped a short distance east of Tsodilo Hills. The next day we drove to Drotsky's Camp on the banks of the Okavango River just south of Shakawe and set up camp in a lovely spot under the canopy of tall riverine trees flanked by tall stands of papyrus reeds. We went for a boat ride on the Okavango River late in the afternoon. Our Landrover friends brought their fishing rods along and managed to catch a bream, which was sufficient to feed the five of us for dinner. The road to Maun was bitumen in contrast to the whitish sandy countryside with lots of dead wood and thorn trees and was uninteresting. Maun on the other hand was a surprise. It's a busy place with lots of rondavel huts lining the highway. The town has grown enormously over the last eight years and is a good lesson on what happens when a town grows with no central planning. There were lots of little roadside provision huts selling Omo, sugar and fresh produce. We saw women and children fetching water in containers of all sorts balanced on top of their heads. Seemed like the true rural Africa until we hit the town centre where we could plug our card into an ATM and withdraw local currency. There were tourists and overland trucks and 4WD rental vehicles everywhere. The supermarkets were well stocked with everything you could want and more. We went to the National Parks Headquarters and make bookings for our intended visits to Moremi and Chobe NP. Bookings were compulsory as each campsite had limited vacancies. The booking slip was also required at the park entry gates. From here we headed off for the Moremi game reserve. The road was sandy and the scenery was beautiful with autumn coloured trees interspersed with the taller evergreens and the ever-present thorn trees. The birdlife was just great. All sorts of vultures, eagles, storks, starlings and kingfisher etc. etc. All very colourful. We also came across our first sighting of the Cape Buffalo, Waterbuck and Lechwe. We were thankful the rains have not come. We have heard that the road to Moremi can be atrocious when wet. We met an Aussie couple in the park who had borrowed a Landrover from a friend in Botswana. 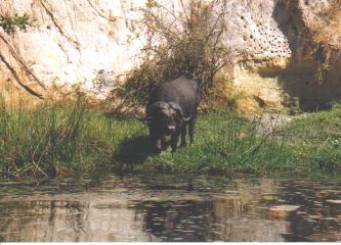 They had been in the park for a number of days looking for the rare African Wild Hunting Dogs. We planned to meet up at the campground at Third Bridge however they never turned up. In the morning we found that their tent was flattened by Baboons and decided we should go looking for them. After an hour we found them bogged to the axle on a sandy section of road. They had spent a very uncomfortable night with the mosquitoes and were very hungry. Further inspection revealed that the Landrover's 4 wheel drive was not working. At Third Bridge camp we had an interesting night with the hippos, baboons, elephants, hyenas and impalas wandering through the unfenced campground. The many different insects also added to the orchestra of animal calls. We awoke to the sounds of baboons invading our campsite. At first they seemed interested in eating the leaves of the trees. Later they decided to join us for breakfast when one big baboon stole a loaf of bread from the back of Troopie and later stole a slice of Vegemite toast from our Landrover friends. We can now imagine the horror of your encounter with the baboons, Max and Sheila. Later that afternoon we got to Xakanaxa Camp and went for a boat ride with two other couples on the Okavango Delta. It was a glorious boat trip. The flood plains, birdlife, animals and sunset colours were all stunning. One of the couples is from South Africa who are a husband and wife team making African wildlife documentary films. A few years earlier they spent twelve months living in the Moremi NP making a film on the African Hunting dogs. We had a very interesting time talking with them. We departed Moremi NP at the North Gate only to discover that our friends Landrover was leaning awkwardly due to a badly broken front leaf spring. We bush camped early and set about replacing the broken spring. On leaving next morning for Chobe NP we came across a pack of twenty-seven Africa Hunting dogs who were on a hunting mission. 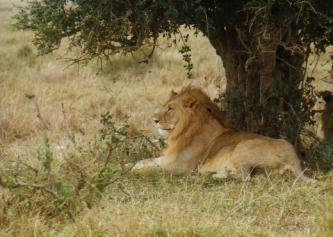 We followed them for a short time and then sat and watched them kill an impala. They were very organised hunters who worked as a team. One pup was left behind during the chase but mum and dad came back and regurgitated a feed of meat for the pup. We hear that hunting dogs are a rare find so we feel really lucky to have seen them in action. Whilst in Chobe NP we saw more lions and elephants. The elephants have been very destructive with their voracious appetite for the leafy green trees. Due to their over population they have stripped much of the vegetation bare and have pushed over lots of trees. The next day we made our way to Kasane which is the border town between Botswana and Zimbabwe. On the way we passed two lions devouring a recently killed baby elephant. We camped at Chobe Safari Lodge that night where our friends decided to change the other front spring to correct the lean on their Landrover which was making it difficult for them to sleep comfortably in their rooftop tent. This took us most of the morning but Kienny enjoyed the time cleaning the car and doing the washing. Su-Lin kept a watchful eye on the resident warthog which had raided some food bins from the Kenyans' Landrover. In the afternoon we crossed into Zimbabwe and headed for Victoria Falls. The custom formalities were straight forward, hassle free and took us about half an hour. In Victoria Falls we camped in the council campsite and met a Dutch overlander who had driven from Europe via the middle east so we had an interesting time exchanging information. Today we went to see the Falls. They were impressive and we welcomed the cooling spray. We watched people white water rafting down the Zambezi River and Bungy jump off the bridge. We had hoped to do the white water rafting however Su-lin was too young to participate so we had to give it a miss. We have found a wonderful drink called "Just Juice". It is 100% carbonated fruit juice and comes in very authentic tasting peach, granadilla, ruby grapefruit, litchi and lemon flavours. It is available all through Southern Africa up to Zimbabwe. I reckon I could make a fortune if we imported them into Australia. So far we have been very pleased with our vehicle and the way we've set it up with the shelving and the rooftop tent. We've had no problems with Troopie and we have all been in perfect health. We have been on the road for two months and have not yet had a night in a hotel. The fittings we had made for our gas bottle have worked like a charm and have had no problems getting our gas bottle filled. We have not yet used our US$ cash or travellers cheques as we have been able to get all our money from ATM's and used credit card extensively - the wonders of modern banking technology! We had intended to send E-mail from Maun but waited till now as the rate in Maun was twice what we had paid anywhere else. Glad to receive so many replies. We have been listening regularly to the BBC and Voice of America short-wave broadcasts. Radio Australia nolonger broadcasts to Africa so it’s good to hear some news from home via E-mail. Tomorrow we'll head east towards Lake Kariba. We have to be in Harare, the capital of Zimbabwe to meet Mal and Wendy (Geoff's sister) in a couple of weeks where we will send you another message.